Cleats & Couture: March Madness is Here! March Madness is finally here & I have filled out 2 brackets for the first time ever. I normally only fill out one because I'm a firm believer in going with your gut, but this year with Michigan having a chance at cutting down the net, I had to fill out two: one with my heart and one with my head. I'll only post one for your viewing pleasure (the one with Michigan going all the way), but Indiana is the champion in my other bracket. I feel like this year, there are so many possibilities for who could walk away with the net. Unfortunately Ohio State is in that mix which kills me, but it is great to see the Big Ten represented so strongly in this tournament. I also do have some good upset picks if I do say so myself. (12-seed Oregon and 11-seed Bucknell going to the Sweet 16). Go big or go home; you can't take all 1-seeds to the Final Four. 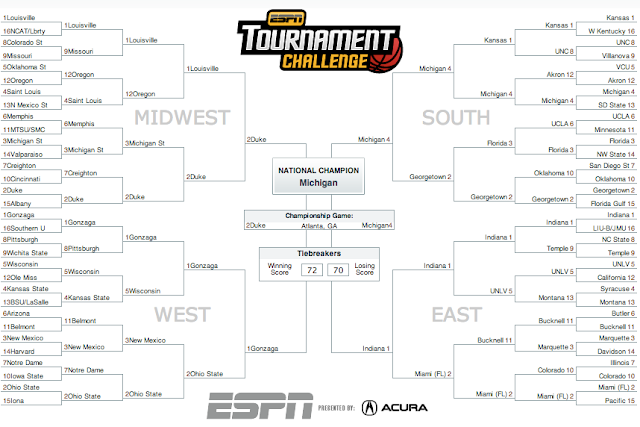 Did you fill out a bracket this year? Let me know who you have in your Final Four & going all the way! Looks good! So excited for March Madness! I'm sure I'll be hitting you up on twitter.